Black 47 is set during the Great Irish Famine, and stars Hugo Weaving (Hacksaw Ridge, The Lord of the Rings, The Matrix), Jim Broadbent (Oscar®winner for Iris) and the prolific Irish screen and stage actor, Stephen Rea (The Crying Game, Michael Collins) along with a strong young Irish cast, including Barry Keoghan (Dunkirk, The Killing of a Sacred Deer), Moe Dunford (Michael Inside, Patrick’s Day) and Sarah Greene (Noble, Penny Dreadful). It’s 1847, and Ireland is in the grip of the Great Famine, which ravaged the country for two long years. Feeney, a hardened Irish Ranger, who has been fighting for the British Army abroad, abandons his post to return home and reunite with his family. He’s seen more than his share of horrors, but nothing prepares him for the famine’s hopeless destruction of his homeland, which has brutalised his people, and where there seems to be no law and order. He discovers his mother starved to death, and his brother hanged by the brutal hand of the English. With little else to live for, he sets a destructive path to avenge his family. After just one weekend, which included sold-out shows nationwide, Black 47 is now the number one Irish film of the year across all of Ireland, with a total box office of €444k including previews. Republic of Ireland delivered €392k, with an impressive screen average of over €5k. It is the biggest opening weekend of any Wildcard title to date. “It’s a great result, and I am thrilled for all the staff in Wildcard and Fastnet Films, and especially director Lance Daly and producer Macdara Kelleher. The filmmakers worked incredibly hard on the making of this brilliant film, and it’s very rewarding to see audiences from everywhere in Ireland turning out in such numbers to experience Black 47 on the big screen”. The box office news comes ahead of the film’s North American premiere at the Toronto International Film Festival (TIFF) this week, and its UK and US cinema releases later this month on 28th September. The Toronto International Film Festival (TIFF) is regarded as one of the world’s most renowned film festivals and is generally seen as an early indicator of Oscar-worthy films. Irish films that screened at TIFF which continued on to Oscar success include Lenny Abrahamson’s Room, John Crowley’s Brooklyn and Nora Twomey’s The Breadwinner, while international titles include La La Land, The King’s Speech, 12 Years a Slave, Silver Linings Playbook and Argo. Altitude Films will distribute Black 47 in UK cinemas from 28th September. IFC Films will distribute Black 47 in US cinemas from 28th September. 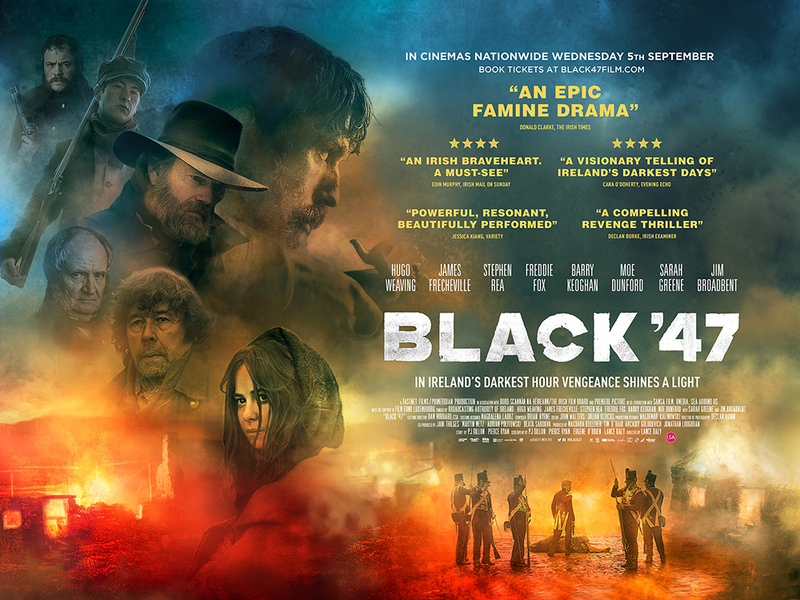 Black 47’s screenplay was written by PJ Dillon (Rewind), Pierce Ryan (Standby), Eugene O’Brien (Eden) and Lance Daly (Life’s a Breeze, Kisses). Produced by Macdara Kelleher for Fastnet Films with Tim O’Hair, Arcadiy Golubovich and Jonathan Loughran, Black 47 was financed by Primemeridian Entertainment, the Irish Film Board, the Luxembourg Film Fund, Wildcard Distribution, Altitude, BAI, TV3, Eurimages, Umedia, Samsa Films and Fastnet Films.